Have you ever wondered what living a digital nomadic lifestyle is like? In today’s episode, Andrea Jordan gives us a glimpse into what it’s like to take your life — and business — on the road. Andrea Jordan is a business strategist who is living a life many people dream of: seeing the world while working remotely. As a digital nomad, she is currently travelling throughout Latin America, enjoying the many sites this region of the world has to offer. She earns her living supporting creative entrepreneurs who want to live a life less ordinary, just like she’s doing. With a rare combination of expertise in corporate law and business coaching, together with a degree in accounting, this woman knows her stuff! 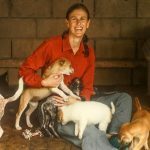 When she’s not working with entrepreneurs, you can find her with a camera in hand capturing the beauty that she sees and volunteering at animal shelters. Be sure to follow her on Instagram to see the many spectacular photos she publishes there regularly. Ultimately, Andrea wants to live in a world where everyone looks forward to Mondays and living a creative life is the norm. I think many of us here at PYP heartily support that vision! Arriving in a new place only to discover the WIFI availability is spotty at best can be a challenge for Andrea Jordan. Hands down, working with her clients to help them see the gaps in their knowledge are her biggest touchdowns. Her special gift is being able to pinpoint exactly what her clients are missing and then helping them find a solution so they can break out of their red zone and run their ball into the end zone. Discover the “Write” Way You Can Have More Success! How can writing help you play your position bigger and better? Grab my free guide here to find out!